This post, following a review of the style choices of one of Britain’s biggest politicians Eric Pickles, looks at one of its slimmest. Jim Murphy started out as a student politician and is now responsible for Labour in Scotland, where he hopes to ensure that Labour retains as many seats as possible in the election later this year. He is energetic and determined, witty and willing to lead from the front. As a senior politician he is most often seen in a sober dark suit. This one appears to be dark brown, worn with a dark blue tie which doesn’t complement it at all. Diagonal stripes elongate the figure; horizontal stripes would work much better. The suit seems a little bit too big for him all round. Certainly the sleeves covering half his hand, and the trouser legs are pooling a little at ground level. The jacket is too long. The shoes are strange with their square, greying toes. If nothing else they look like they need some polish. A pair of tan shoes would make all the difference to a suit like this. Having said all that it is a lot better than the outfit on the man from the HSE (behind him). Jim Murphy is very slim, but he is also athletic. He is not just keen on football (required) but also he plays the game quite seriously. And he runs marathons. And he is a vegetarian and teetotal, with an affection for an unpleasant Scottish fizzy drink known as Irn Bru. 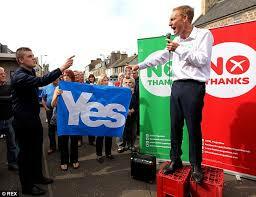 He stands on the crates as he addresses the crowds in the recent referendum. These images demonstrate what a “slim Jim” Mr Murphy is. He looks like “a yard of pump water” as my Grandma used to say. And although tall and slim is the most desirable look in modern culture, if your face is also rather long, like Jim’s, you can still look out of proportion. Also we expect our leaders to have stature – broad shoulders are seen as very desirable in male leaders. In terms of his colouring Jim started out a typical Celtic kid. 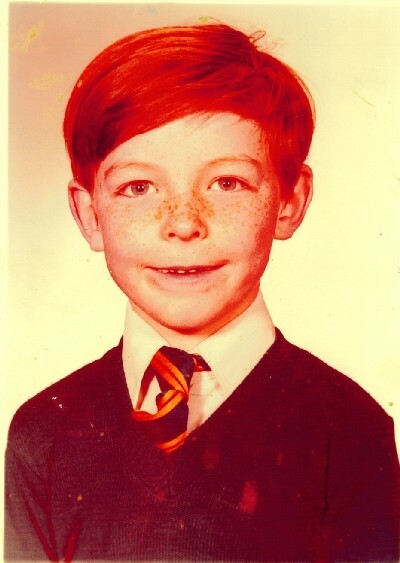 Although the colours are enhanced on this picture he was clearly red-haired and freckled as a child. This would put him as someone with warm colouring, probably at the lighter end. So in terms of business suits Jim will suit lighter shades, and colours with some yellow in them. You can immediately see how the lighter grey suit is better than the navy blue, and the orangey red tie is much more flattering than black. Also as his hair gets a bit greyer he should try wearing lighter shades, perhaps choosing a shirt that is more creamy, or perhaps a peachy pink or light warm green. The darkest colours also have a slimming effect – not something Mr Murphy really wants. He instinctively knows he looks good in his shirt sleeves – this is because wearing a pastel shade or cream makes him look a bit broader. Also for this BBC interview he has combed his hair forward a little which stops his forehead looking quite so long, compared to when he brushes it back. Similarly the grey jumper over a shirt and tie (although not my favourite look) bulks him up in a positive way. The silvery grey is a nice light colour, but I would have prefered a brown or gingerish shade instead (with some warm yellow in it) to complement his hair and skin tone. In the montage at the top of the post you can just see Jim in his casual clothes. 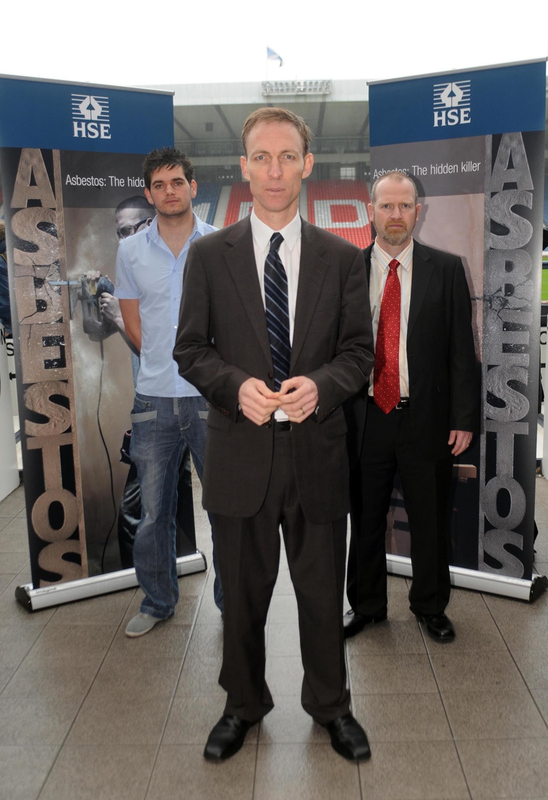 By wearing two contrasting colours – navy and beige – with a bomber jacket and Converse shoes, Jim Murphy looks great. So tips for a tall, slim man?